Announcing The Modern Applique Workbook! Who says modern quilting can't include applique? Not me! And now I have written the book to prove it! 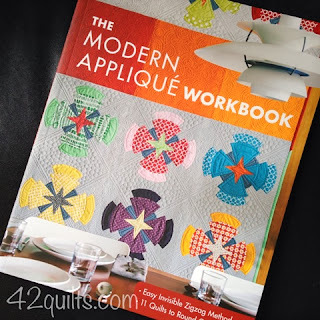 Okay, so that's a bit dramatic, but honestly, I'm so excited to tell you about my new book - The Modern Applique Workbook! It's a step-by-step workbook that includes plenty of how-to photos so you can easily follow along and learn my method. I also add in every hint and tip I've amassed over the past 12 years so you can create beautiful applique of your own! And to jump start your applique journey, I've included patterns for 11 small quilts that you can recreate quickly to perfect your skills. It's no secret I love applique and always have. When I started quilting, I thought applique was too hard. My feeble attempts at needleturn applique didn't come out looking like I wanted and I hated the look of fusible web - not to mention the fact that it doesn't hold up after multiple washings (but that's a story for another day!). Then, one day at a guild meeting a guest speaker demonstrated how to use freezer paper to prepare applique shapes. Wow! It was a game-changing day for me! I stopped by the store on the way home from the meeting to buy freezer paper and glue sticks. Since then I've appliqued everything I can think of from traditional album quilts to kitchen forks and spoons! And I'm still appliqueing to this day! Over the next several weeks join me as I tell you more about my philosophy of applique and show you some of the fun, modern projects from the book. I tend to post on Facebook more than here, so be sure to like my page on FB www.facebook.com/42quilts so you don't miss any of the fun and I post occasionally on Instagram, too at www.instagram.com/jeniferdick. If you're interested in ordering the book, I'll have it available mid-December at my shop. And I'll be having a giveaway and other fun things going on in January too! I can't wait to share The Modern Applique Workbook with you! Wow! Well done you!! Sounds very interesting. I shall keep an eye out for it.